UN Secretary-General Ban Ki-moon said Monday he is considering his direct involvement in inter-Korean issues and a visit to Pyongyang. "I am ready to play my part to work toward a peaceful and denuclearized Korean Peninsula, including through my own personal engagement such as a visit to North Korea when the situation seems right," Ban said as he accepted the 2012 Seoul Peace Prize. "I also look forward to the day when North Korea moves to heed the international community's call for abandoning all nuclear weapons to denuclearize the Korean Peninsula, and for improving the lives of its people through respect for human rights," he added. The Seoul Peace Prize was established in 1990 to mark the 1988 Summer Olympics in the capital. 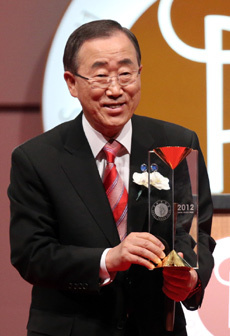 Ban is the first Korean to receive the award. The selection committee said Ban was selected due to his contributions to world peace through mediation in conflicts around the world. He will donate half of his US$200,000 award money to a trust fund for the families of deceased UN workers and the other half to a fund supporting the global agency's mediation efforts.